These can be arranged on a regular basis or as a one off experience. Regular sessions can be arranged on a weekly basis subject to a slot booking and availabilty. These may take place at Baltic wharf or Chew Valley Lake. One off sessions at Baltic Wharf, such as one day taster visits or five day activity week sessions, can also be arranged. Please contact us to discuss your requirements. 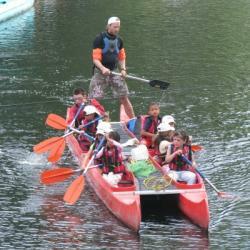 The boats used will depend on the experience, skill level of the students which will be assessed by their instructor. We have a wide range of boats to choose from, ranging from bugs to RS fevas, with toppers and picos in between. We are now able to offer paddlesports and rowing in addition to sailing for schools and groups. The number of students who can be accomodated is in a ratio of six to the instructor. We specialise in organising bespoke sessions for your requirements. Please ask for more details from the office 0117 929 0801. Please click on this link to view South Glos and Stroud College Students enjoying their first session with us.